The Beer Watcher: A New and Local Option? I went to pick up some videos for “family movie night” tonight (a pretty much weekly event in the Krause-Wannamaker house during the school year– tonight it’s going to be part 2, possibly also part 3, of the Back to the Future series, per Will’s request), and right next to the video store that I usually go, I noticed this: a “home” beer and wine brewing/making store. It’s a work in progress (right now, there is some kind of campaign headquarters for Debbie Stabenow and Jennifer Granholm in the back), but it looks promising. 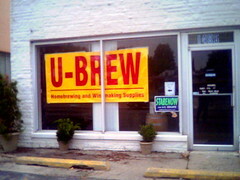 Best of all and not obvious from this picture: it looks like this is a place where you can actually do the brewing there. From my peeking in the window, it looks like there is some sink and cooking space being constructed. Since the biggest problem with home brewing is the equipment and the potential for mess, this is very promising indeed. Why is it the Krause-Wannamaker house and not the Wannamaker-Krause house? Well, sometimes it’s Krause-Wannamaker, sometimes it’s Wannamaker-Krause…. Sometimes, the Krausamaker; sometimes the Wannakrau…. etc.